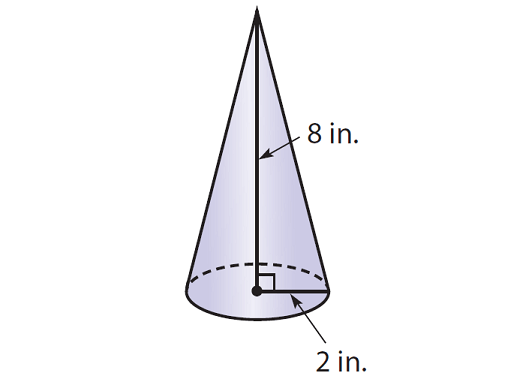 About "Finding the volume of a cone"
Worksheet given in this section is much useful to the students who would like to practice problems on volume of a cone. 1. Find the volume of the cone given below. Round your answer to the nearest tenth if necessary. Use the approximate of value of ∏, that is 3.14. 2. 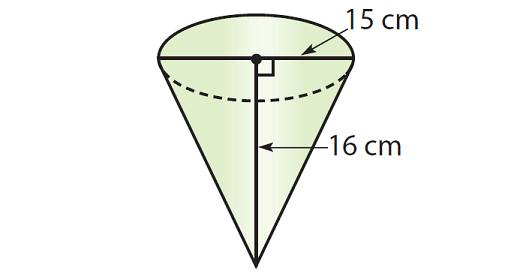 Find the volume of the cone given below. Round your answer to the nearest tenth if necessary. Use the approximate of value of ∏, that is 3.14. 3. Find the volume of the cone given below. Round your answer to the nearest tenth if necessary. Use the approximate of value of ∏, that is 3.14. 4. Find the volume of the cone given below. Round your answer to the nearest tenth if necessary. Use the approximate of value of ∏, that is 3.14. 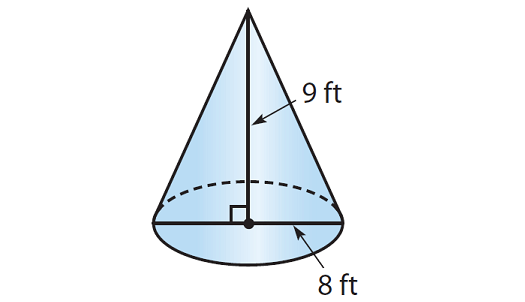 Find the volume of the cone given below. Round your answer to the nearest tenth if necessary. Use the approximate of value of ∏, that is 3.14. Write the formula to find volume of a cone. Hence, the volume of the given cone is about 33.5 cubic inches. To find the volume, we need the radius of the cone. But, the diameter is given, that is 8 ft. So, find the radius. Plug ∏ ≈ 3.14, r = 4 and h = 9 in (1). Hence, the volume of the given cone is about 150.7 cubic feet. To find the volume, we need the radius of the cone. But, the diameter is given, that is 15 cm. So, find the radius. Plug ∏ ≈ 3.14, r = 7.5 and h = 16 in (1). Hence, the volume of the given cone is about 942 cubic cm. Hence, the volume of the given cone is about 12.6 cubic feet. After having gone through the stuff given above, we hope that the students would have understood "Finding the volume of a cone worksheet". Apart from the stuff given on "Finding the volume of a cone worksheet",in this section, if you need any other stuff in math, please use our google custom search here.